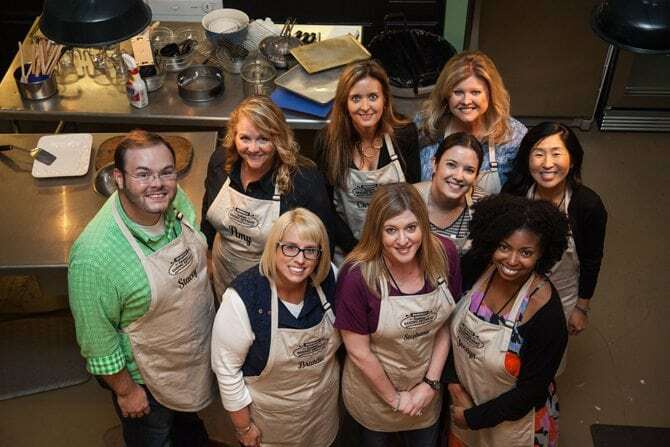 A few weeks ago, I had the great privilege of being a participant at the Southern Baking Retreat in Nashville hosted by Martha White and White Lily. You know them both as amazing Southern brands that are staples in many homes, so it’s always an honor to be involved with them. It was a truly amazing experience all the way around. It’s so great to learn all about the brands and stay on top of new products they are launching. As part of the event, they paired us up and had us create a recipe using Martha White Muffin mixes based on popular country songs. Well, low and behold, who do they pair me up with? None other than my buddy Brandie from over at The Country Cook! Our song was Tim McGraw’s “Meanwhile Back at Mama’s.” Brainstorming immediately brought us to the comfort foods that just taste like home. Sweet Potato Casserole is one of those things for both of us and we thought that it would be perfect starting point and a great way to use Martha White’s new Sweet Potato Muffin Mix. Brandie took the lead and we dreamed up this Mama’s Sweet Potato Cake with Marshmallow Buttercream Frosting. And y’all, that frosting is AMAZING! Seriously. 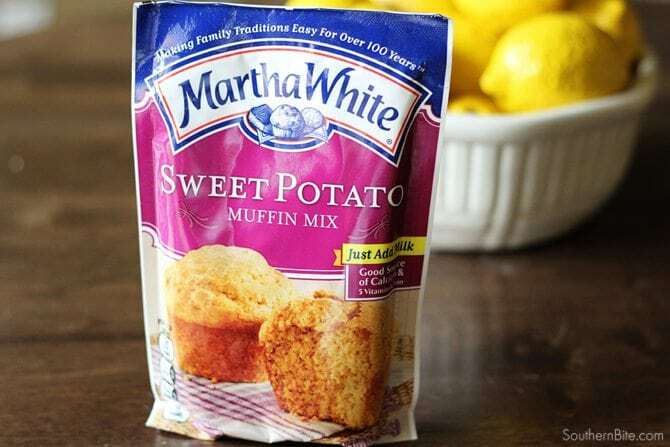 This new Sweet Potato Muffin mix has to be one of my favorite Martha White mixes. It’s just so good! 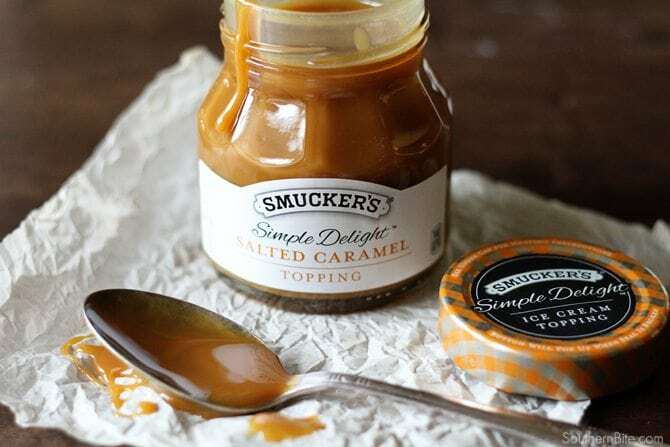 We also took advantage of another great Smucker’s product – their Simple Delight Salted Caramel Topping – to give us that caramely flavor that sweet potato casserole is known for. 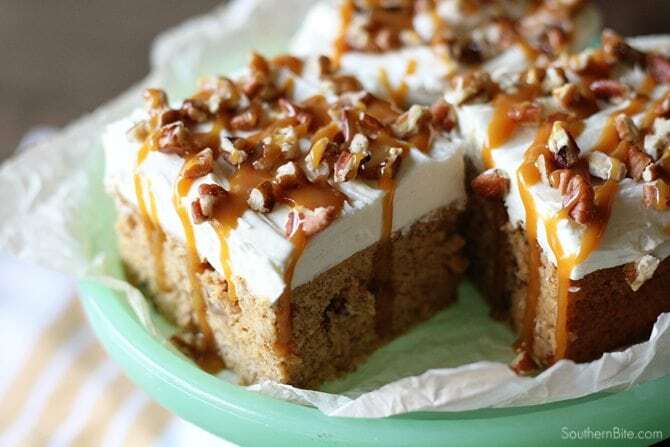 So here it is… Delicious, moist sweet potato cake with pecans, topped with the most amazing marshmallow cream butter cream icing, drizzled with salted caramel and topped with more chopped pecans! Each bite is a true taste of home. But seriously… that icing… whew. Brandie and I have been daydreaming of all the other things to put it on. Something tells me that this is not the last time you’ll see icing like that on SouthernBite.com. 🙂 Y’all enjoy! 1 cup butter salted or unsalted, softened to room temp. Preheat oven to 350F degrees. Spray a 9x9 baking dish with non-stick cooking spray. Then stir in milk and sour cream. Once combined, gently stir in chopped pecans. Spread frosting onto cooled cake. Sprinkle top with chopped pecans. Then, using a spoon, drizzle salted caramel over the finished cake. Depnding on how large the slices, you should be able to get 9-12 slices of ckae from this recipe. Once cake is cooled, you may invert cake onto a large plate and then frost. This makes it a bit easier to slice and serve the cake. For a thinner cake, use a 9x13 pan and adjust baking time accordingly. Looks absolutely heavenly!!! I pinned it to make later! Thanks, Maribeth! I sure hope you enjoy it! I’m allergic to all tree nuts. Will the cake suffer if I leave out the pecans in the cake and on the icing? 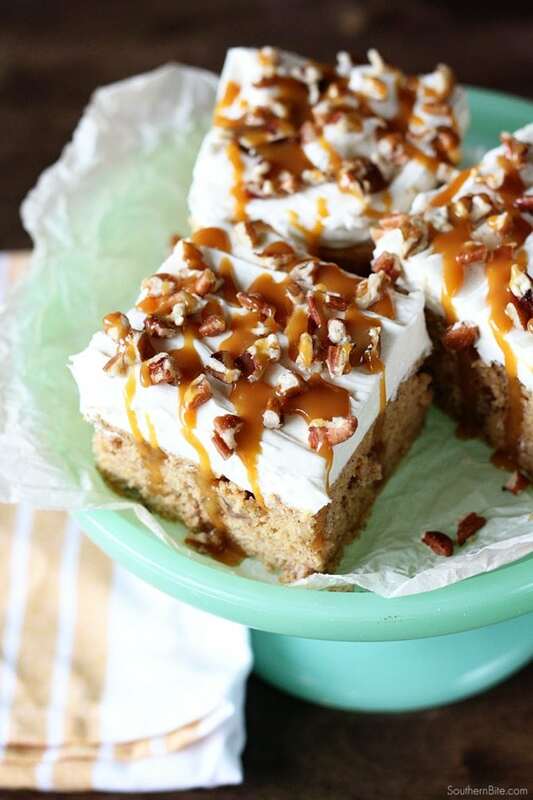 I would so love to try this cake but cannot find Martha White sweet potato muffin mix anywhere in my area. The online store is charging $8.99 for shipping on a $2.19 item which is out of the question for being so costly. Where are you located, Susanne? 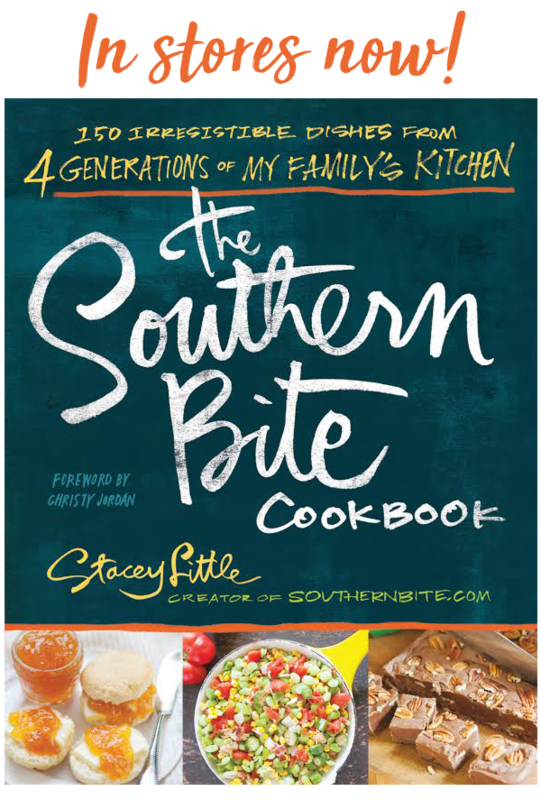 My heritage is true Southern as well, and I savored many dishes my granny made from sweet potatoes. (One of my favorites was rather plain but so delicious: fried sweet potatoes and meal gravy. It was sweet, salty, and savory all at once!) I am always looking for a good recipe in which to include them. Can’t wait to try this one! Best to you. Those Granny’s sure knew how to cook. 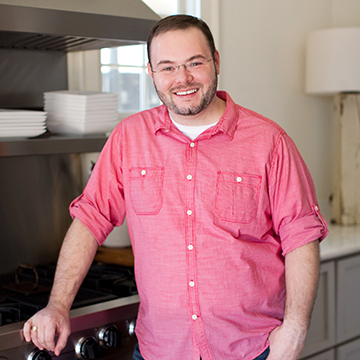 Hope you like this recipe and make it for years to come. I live in Washington and I also cannot find the Sweet Potato Muffin Mix. Is there something else I can substitute? 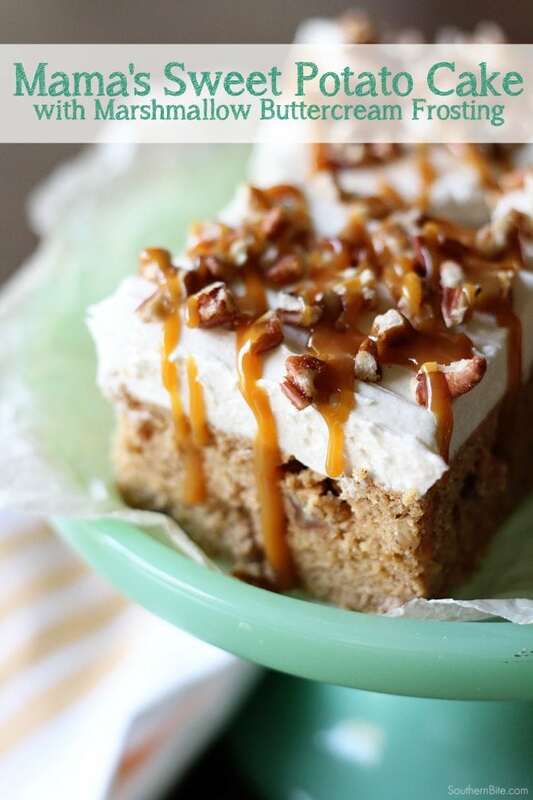 I really want to make this cake which sounds absolutely amazing. You can use any muffin mix as long as it is for 6 muffins. Pumpkin would work in this also. You can find the muffin mix on Amazon as well. Great news! I’m so glad you found something that worked! These bars look absolutely perfect! Also we had the most amazing time didn’t we? Thanks, Jocelyn! We did have a great time! So great to meet you! 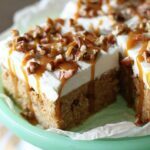 I am so disappointed that I missed out on this retreat…I am looking forward so much to the Southern Food Blogger Retreat in November…especially if it means getting to eat delicious stuff like this! Looks great! LOL! Looking forward to meeting you, Mary! Made this last week, and it was a huge hit! I have already bought the ingredients to make it again. The frosting is good enough to eat by itself!